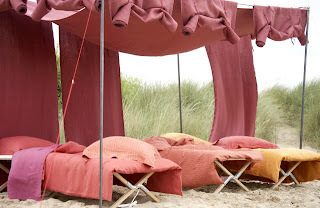 I’ve always loved Belgian linen. 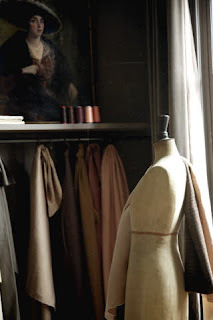 I like the cool, dry touch of a linen shirt, the soothing coolness of linen sheets, and the crunch and texture of sheer washed linen curtains blowing in the summer air. 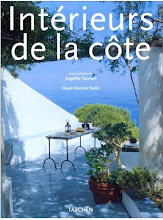 I especially love pure white linen and I have a collection of white linen shirts and blouses to wear in the South of France and India and other hot-weather places. I’m not a wash-and-wear kind. Linen looks so impeccable when it’s just pressed, and so endearingly floppy and soft and friendly when it’s washed and worn a few times. In Paris in the summer, some of my favorite sights are the bookish 'intello' types who hang out at Café de Flore and Les Deux-Magots, garbed in a well-worn linen shirt, rumpled and crumpled, its contours over time taking on a certain languor and ease. One of my favorite rooms in Axel’s castle just outside Antwerp is the second floor sitting room. It has a scrubbed oak floor, and is furnished with an armchair in mocha linen and an overscale sofa with a pale ivory linen cover. This room is super-subtle and monochromatic with ivory plaster walls. 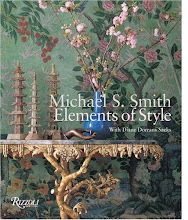 Splashes of black from a gold-framed massive Tapies painting, a fireplace with a granite surround and a Japanese calligraphy, are juxtaposed in spring with over-arching flowering branches of wild rhododendron from his garden. The effect in the sumptuous castle setting is very understated, giving the room a somewhat Japanese austerity. The sofa in this room is slipcovered in washed ivory Belgian linen, simply tailored over the wide flat seat and narrow arms. 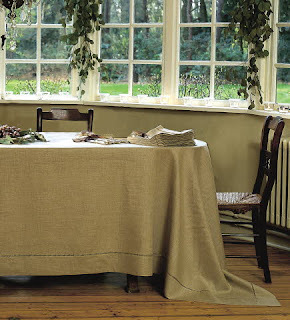 This lovely linen, simple and pure, drapes softly and neatly down to the plank floor. 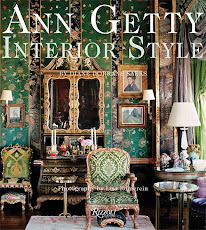 It is a breath-takingly plain performance, in a castle where antiques of noble provenance and museum-worthy works of art would usually command embroideries, brocades, silks and other heavy-duty traditional textiles. Belgian designers love their linen—and use it with power and confidence. 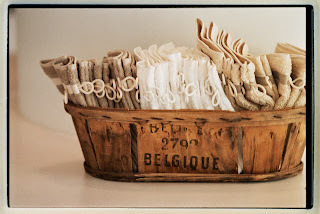 In contrast with the silks and brocades and lavish textiles beloved in French décor over the centuries, linen has always been a favorite element in Belgian décor. 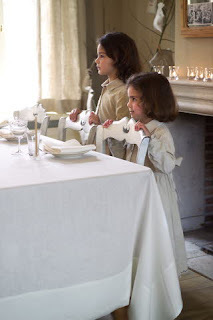 I was reminded again of the effectiveness, grace and character of Belgian linen some years ago when I was visiting Brussels to conduct private antiques research. Invited to visit the newly decorated apartment of Jean-Marc Louis, an Algerian-born Belgian artist whose works I had recently acquired. I walked with him through a maze of cobblestone streets and lanes fragrant with mediaeval bricks and centuries-old stones, amid shadow and light and springtime lime blossoms. Finally, we turned to enter an oak doorway. We traversed a dark corridor, and marched up several flights of steep sixteenth-century wooden stairs worn to smooth satin by countless leather soled and hundreds of applications of floor wax. Up and up we went, until we arrived at a black-painted door opening into Jean-Louis’ apartment. 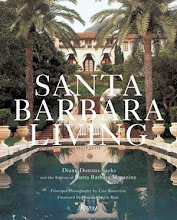 Plaster walls were white, floors were scrubbed old oak planks, and tall narrow windows were open to welcome views of slate rooftops and a jumble of chimneys. 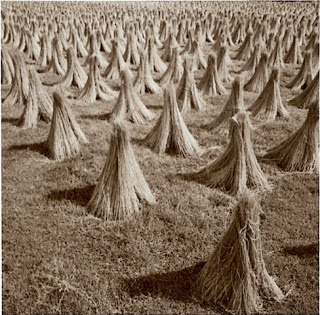 Was I in the twentieth century or the seventeenth? 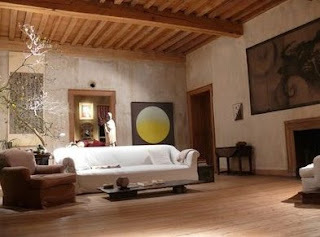 I turned to take in the pared-down and superbly edited living room. 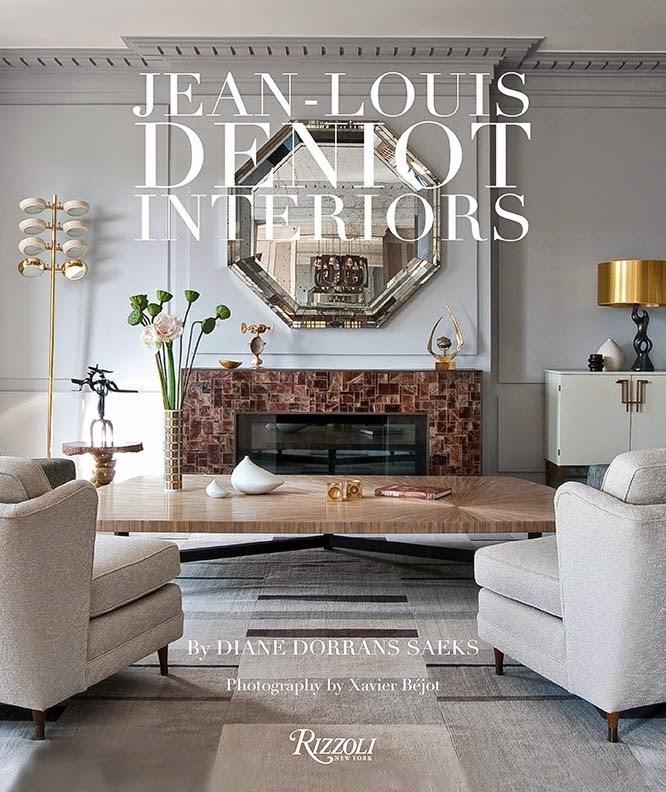 Then I saw it—the Belgian linen signature—a large Vervoordt-esque sprawling sofa upholstered simply in heavy linen in the strangest and most compelling color, used so boldly in this graphic traditional/modern interior. It was a color with no name. The hue was a dulled down purple/violet/plum color with a good dose of grey. I would say the color was dour. But elegant. 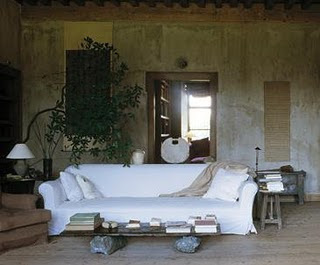 Sunlight splashed through the lead windowpanes of the apartment and illuminated the grey/plum sofa. The sober color seemed at once ancient—as if it had been dyed from some long-ago extinct plant or flower and washed in the river. At the same time, the sobriety of the color and its oddness made it look entirely new. Belgian linen has clearly left its impression on me. 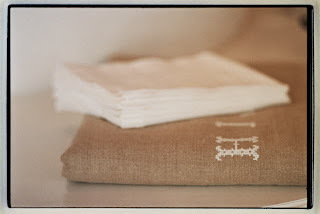 While the bed linens I usually slumber on are pure white Frette Egyptian cotton, I also keep sets of hemstitched white Belgian linen sheets for summer. Freshly pressed, they remind me of summers in the Swedish archipelago, of the gilded suites at Il Palazzo at the Bauer in Venice in the summer (the linens gloriously cool on a hot summer day) and long ago romantic hot-weather idylls in hidden apartments in Rome and Capri. Onward to the present. 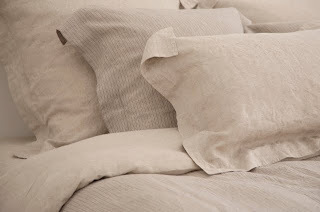 I’ve just rediscovered that classic Libeco pure Belgian linen is now available in the US. (See below for information). There is the Libeco Home collection, which includes versatile table linens and traditional bed linens, as well as 100 per cent linen apparel and accessories, fringed scarves, and superb white linen shirts for men and women. The styles are simple and unadorned—all the better to show off the essential character and purity of the linens. 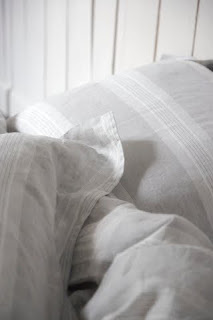 There is even pure linen sleepwear, which is always a luxury, and always hard to find at any price. 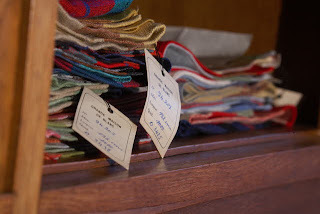 The company was founded around 150 years ago, and the quality and weaving are superb. This is the real Belgian style—in all the austere and low-key colors that are the signature of Belgian interiors. 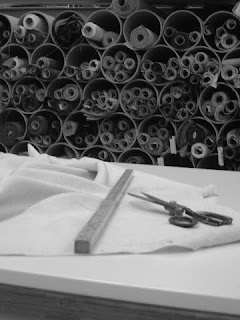 The best aspect: the Belgian designers for this company have stayed true to Belgian aesthetics and ideals. 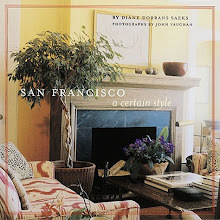 It’s pure style—not meddled with or changed at all for an international market. 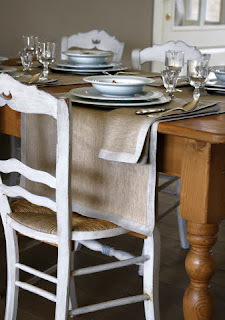 Among my favorite new Libeco products are a collection of table clothes and pillows in soft colors like flax, pewter, moss, taupe, fog, dark grey, mauve and natural. 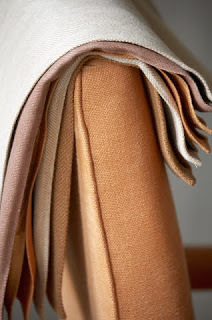 This is the archetypal Belgian color palette—subtle, soft, sober, slightly dusty and powdery, and a wonderful tranquil antidote to screaming colors and primary tones. 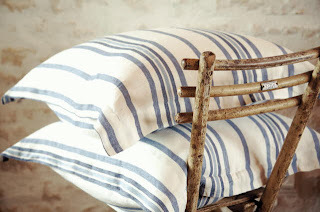 In the new January 2010 collections I love the chunky knit linen throws and blankets in natural hues (so chic), as well as striped fringed throws, and pillows and sheets in floral prints. Noteworthy are eco-linen towels, heavy twill tablecloths (true heirlooms), as well as pinstriped linen sheets and duvet covers. 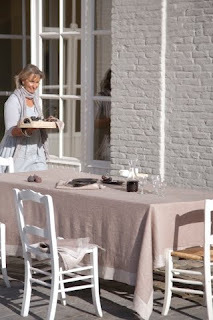 To entice designers to follow in the Belgian mode (and perhaps in the footsteps of Axel Vervoordt), Libeco also offers pure linen by the yard, for upholstery and curtains (from select retailers, check on www.libeco.com). 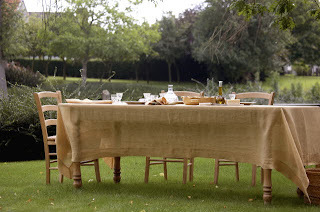 Some designs, such as Sienna striped tablecloths are in natural linen with a rather rustic feeling. 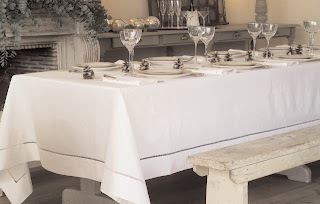 Other tablecloth designs, like Libeco's Venise, Vence and Champlitte, are classic white, timeless and very elegant. Pure white linens (also in linen-cotton blends) will never go out of style. They are true heirlooms. Vence is also available in colors like celadon, henna, plum frost (that gray/plum I love), picholine (olive), taupe, sage, oyster, and mauve. 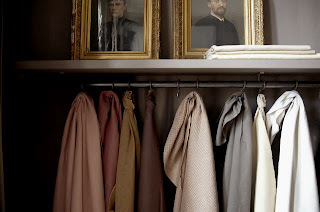 Among the apparel collections, I appreciate the white shirts, as well as a series of ethereal fringed shawls in plain colors like oyster and pale blue. 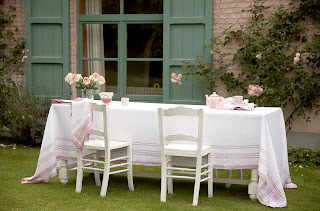 For a trousseau, Libeco’s Basics are an enchanting series of bed linens, in white, light blue and rose, as well as white edged with blue or rose. 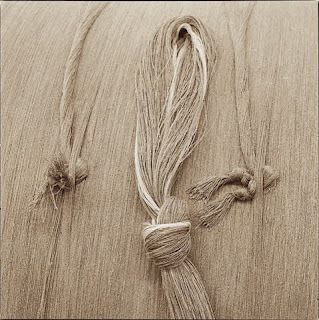 Belgian linen. I can’t have enough. 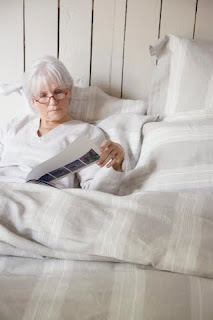 Basics pattern – White 100% Linen Queen Flat Sheet: $295. 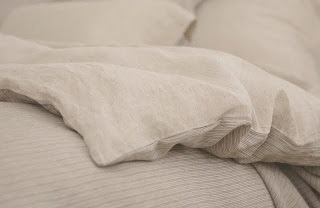 Vence pattern – Café Noir, Light Grey, Oyster, Spice or Taupe 100% Linen Queen Flat Sheet: $275. 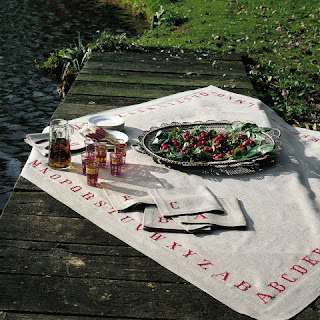 Libeco Home linen by the yard – Available through Libeco Home Retailers. 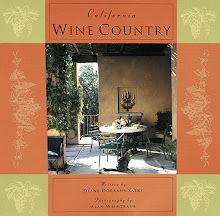 (Check on www.libeco.com to find retailers.) 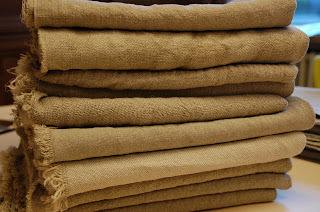 100% Linen by the yard from $95.00 yard (at 72” width). 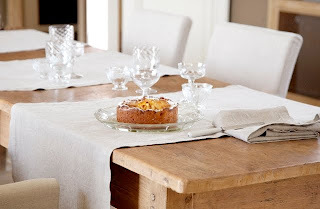 Bastia – Apricot or Fig Striped Linen tablecloth, from $150 (for 69” x 71”). 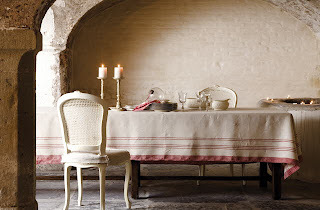 Frascati – 100% Linen reversible tablecloth, from $199 (for 69” x 69”). 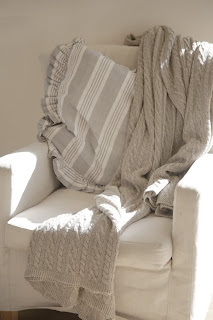 Rapallo – 100% linen cable knit throw: $460.00. 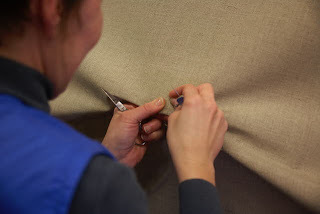 Chester – 100% Linen Grommet Drapery: $340.00 ea. (55” x 106”). www.libeco.com – click on ‘Consumer’ for a list of points of sale per country. 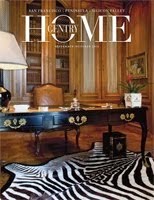 www.LibecoHomeStores.com to buy products worldwide online. 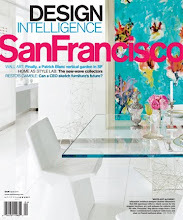 Libeco Home New York sales office: 212.764.6644. 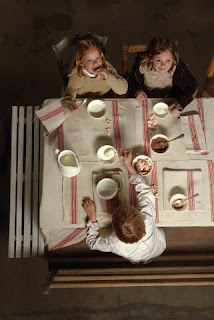 Photography credits: Belgian linen products photographs courtesy Libeco, used with permission. 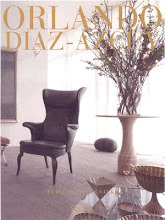 Photograph of Oriental room designed by Axel Vervoordt, from 'Axel Vervoordt Timeless Interiors’ published by Rizzoli. Used with permission. 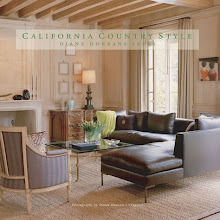 Your posts Diane are always incredibly thorough and full of useful facts and information. 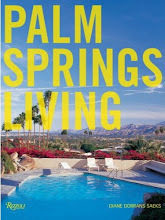 Whether it be art, travel, architecture, house & home to stylish living, never a stone unturned. Always such a joy to read as are your books. Dear DT: Loved hearing from you. Your blog is looking fantastic! 'Never a stone unturned'...is that going to be on my tombstone! It would be a good thing. Stay in touch. I have some wonderful stories, unexpected, in the works. LOVE, LOVE, LOVE this post! 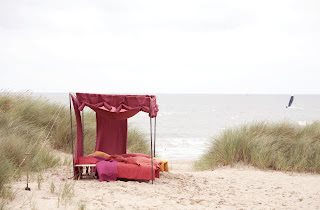 Nothing like the luxury of being surrounded by linen everywhere... thanks for the inspiring photos! Thorough indeed! 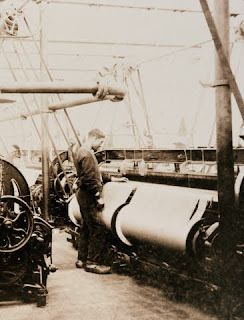 You turned this post on linen into a practical manual on the weaving, history and fashion of the fiber. The pieces I own are cherished and , thanks to you, I think I will be adding to my collection. Terriffic post!!!!! !Awesome pictures! We carry Libeco here at Beadboard and sell a lot of cut yardage which is fantastic because their cut yardage comes in 94" to 110" (approx ) lengths!!!!!!!! !Much less seaming! I have been singing the praises of this line for years! You are a girl after my own heart!They have a beautiful new spring collection I did a post on a couple of weeks ago great grays and new colors in the tabletop....Thanks! diane, i so enjoyed this post as i have been carrying libeco for 6 years and just love the company. 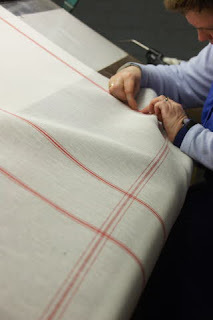 not only is it the best quality linen to be found but the washable aspects of it are fantastic. and, being a designer and retailer, that is critical. also, the customer service is impeccable. Hi Hound Hill-Thank you very much for your lovely comments. 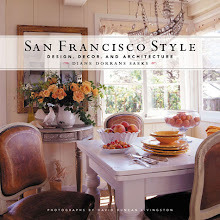 This is a great linen resource for designers--and as Beadboard noted, the cut yardage comes in 94-110 inch lengths. It's great to know. Theresa, Hello-Thanks for your compliments. I appreciate your note about 'practical manual'. 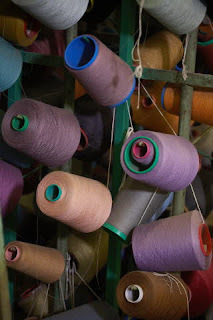 My blog features are long and I like to add lots of detail. I write these features to stay on my blog, to be a reference permanently findable on Google, and be read over and over. Many of my readers tell me they bookmark features to keep for reference. I'm so pleased. Beadboard! I adored your posts on your website about Paris. Love 'LaCarotte' apartment. I hope you are going to tell more. Cooking Bresse chicken in an unknown oven...now that's bravery. I loved hearing from you--as I know you just saw all of these Libeco new designs I featured, when you visited Maison & Objet. 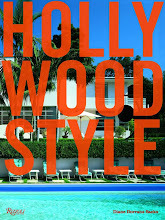 I think the photos are very stylish--and these are all the newest lines and styles. Pamela, Dear- I am loving hearing from retailers who carry Libeco. 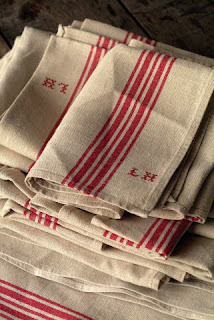 You are right that these linens wash fantastically well--and it's the wash-or-press aspect of linen that appeals to me. 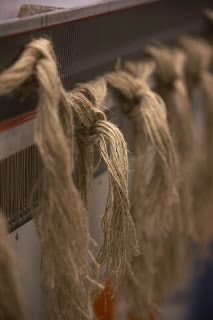 I am not at all a 'throw it in the washing machine' kind at all--so I love the natural finishes and colors and feeling of linen. Stay tuned...lots more great features in the works. I especially love its pristine feel and appearance-even when full of wrinkles. the soft grays, mauves, lilacs just perfect , I love the table linens you've shown here and the AV sofa is perfection. yet comfortable like the fabric itself. I agree, linen is great freshly ironed or softly wrinkled. 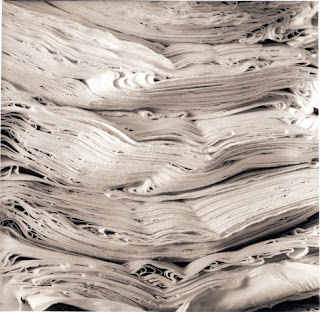 Those kinds of wrinkles are beautiful on high quality linen. 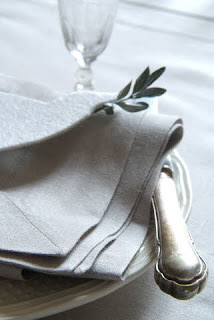 Love Libeco's table lines, especially the oversized napkins. Great post and enlightening for those who are afraid of a few wrinkles. This is such an interesting post, love it. 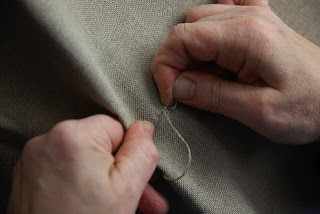 The luxury of linen is only matched by its simplicity. The best dreams happen when I sleep in my hand embroidered linen sheets bought for me by my father when I was 15 years old as part of my future wedding kit (corredo di nozze). I still own some of my mother's linens, even more beautiful now after eighty years. 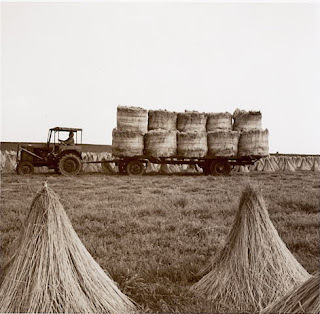 Great post composed with beautiful pictures and your writing to perfection. Love your blog.. and such amazing posts here... simply loved them! !